The building lobby is secure with 24 hrs. camera surveillance. Guests are buzzed into the lobby from the unit for access to the elevators. One reserved parking in the secured underground parking garage has direct access to the building elevators for the tenant. Additional parking is in the open parking lot. The building is located on the exclusive Ormond Beach end of Daytona. Robert is an Architect, and Cathy is the manager of Interiors with Walt Disney Imagineering. We only own this one vacation home and we like to spend as much time here as possible. Therefore, we have equipped the unit with everything that we like to have in our home, and it is all available for your use. When we were looking for a vacation home, we looked on the west coast around St. Petersburg and the east coast from Melbourne to Daytona. We choose Daytona because of the activities and because of the quality of the Horizons building. 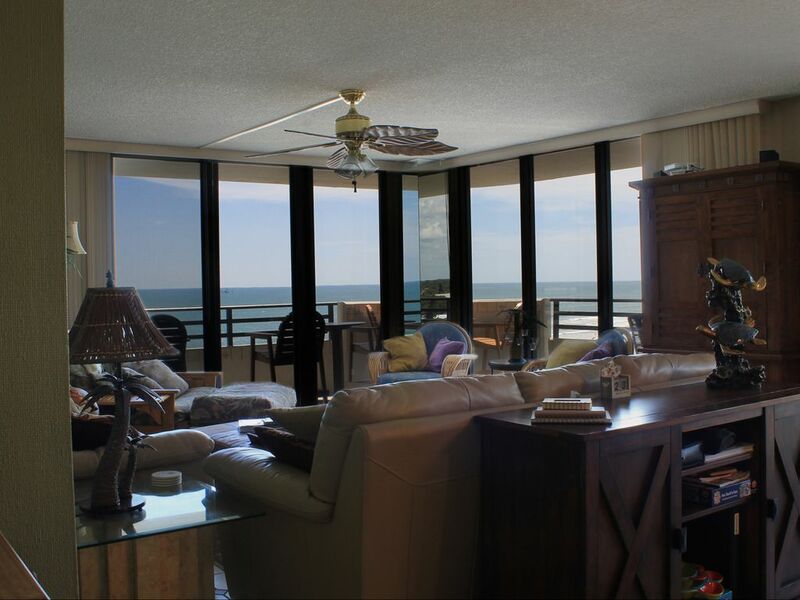 This condo is large and spacious with views from every room. We can have a large group here and still have privacy. the building is right on the beach and you do not need to cross a road to get to the beach. We enjoy sitting on the balcony in the morning and watching the dolphin. one secured spot in the garage. Additional parking in the open lot, first come, first serve. There is a secure garage in the basement with one space available for your exclusive use. Once in the garage you can access the building and elevators without going outside. All televisions are connected to the cable service. The surround sound system in the living room can play cds, the radio, and flash drives. several board games and puzzles are in the condo. There are tow flash drives in the unit. One flash drive is loaded with beach music, and the second is loaded with music from the 70's, 80's, and 90's. The video collection is extensive with movies for all ages. Sorry, there are no R-rated movies. The building and unit are accessible. However, there is a high track on the sliding glass doors preventing wheelchairs from accessing the balconies. And there are stairs down to the beach. You can drive to the beach and park on the beach for access. The sauna is off the exercise room, You will need the building key to access. There are beach chairs and paraphernalia in the parking space for renters use. There is also a concession stand on the beach to rent all sorts of water sports equipment. We absolutely loved our stay in this condo over spring break!! The condo was everything that was described and than some. There was more than enough space for our family of 6. Everything we needed was in the condo. Including plenty of beach towels and beach chairs for everyone which made our travels so much easier. I loved waking up to the sunrise and sounds of the ocean in the morning. The beach outside of the condo is fantastic. Not too busy with people at all. And not too many cars that drive by on that section. The few that do, my boys thought were awesome. Nice hard compact sand that is easy to walk on and not too many shells that hurt your feet but still plenty of shells there to collect a few. The Carvers are great people to work with. Very informative and answered any questions we had very quickly. We definitely would stay again!!! Thank you Carvers!!! Property was beautifully decorated and well equipped. Beds were very comfortable and amble closet space in all bedrooms. Location of the condo is also great with good restaurants close by. What’s blast! Plenty of room, loved having plenty of beach towels, chairs, toiletries! The Carvers puts lots of thought and care to bringing convenience and comfort into this place! We had such a great time- will definitely be back! Thank you to the Carvers! The condo was well decorated, everything we needed was there to be able to cook, sleep, and enjoy. Loved the wraparound view, the pool, the beach, the proximity to the pier and other things to do. The condo came equipped with everything we could possibly need. Loved the master suite...so big!! Plenty of beds and linens and towels. Only suggestion would be to have more keys provided. The only reason I did not rate this condo 5 stars was because of the discomfort of the sofa that was a sofa bed. The cushion wouldn't stay on the sofa when you sat on it. Also, there was a wooden chair that the cushions were worn out on and was uncomfortable. BUT, the balcony is wonderful! The kitchen is EXCELLENT - fully stocked with dishes and pots and pans that you would need to cook whatever. The refrigerator is HUGE and has an ice maker. And the dishwasher is totally silent when running. The beds were very comfortable and the overall layout of the condo was perfect. Fans in every room, including the kitchen! We've never stayed in a rental condo that was so stocked with everything you need for the beach (beach towels, beach umbrella, beach chairs, boogie boards) as well as things to do while in the condo (so many movies! games! TV in the den and in each of the 3 bedrooms!). The building is very secure, the pool is clean and inviting, and there's even a small work-out room! We will definitely try to rent this condo when we are in Daytona again! The following are within a 90 minute drive: Walt Disney World, Universal Studios, Seaworld, St. Augustine, The Space Center, and the Ponce Inlet Lighthouse. There are several restaurants and shops all along Atlantic Ave. The grocery store and shopping center is .8 miles north of the condo. A rental agreement must be signed when unit is booked.